The scribe in today’s Gospel asked Jesus the deepest question: Which is the first of the commandments? The scribe was a man learned in the Scriptures, an expert in the law. Was it a trick, or did he really seek to reduce the thousands of laws into one simple one? And who is my neighbor? 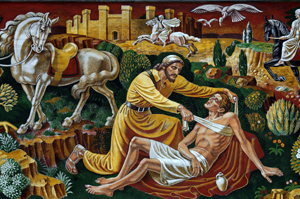 Remember the story of the Good Samaritan? Can there be such a thing? A non-Jew, someone outside the clan, outside the inner circle, an enemy. Could Jesus possibly mean them? Is He asking us to love them? Jesus took the old law and filled it with new meaning. It’s easy to let rituals and laws take the place of love. The priest could pass by the wounded traveler on the road because he was on his way to the more important temple worship. Jesus sums up all the commandments in one word: love. You cannot really love God without loving others. You cannot really love others without loving yourself. You cannot really love yourself without loving God. It’s a trinity of relationships—and your choice!